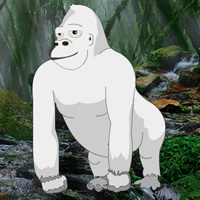 Wow White Gorilla Escape is another point & click escape game developed by WowEscape. In this game, you came to see the beauty of a forest. But unfortunately, you noticed that someone trapped a white gorilla in a cage. You have to find the way to rescue the gorilla by finding useful objects, hints and by solving puzzles. Click on the objects to interact with and solve puzzles. Good luck and have fun! Been a good few years since I played this site! last orange egg in waterfall left of gorilla scene - gave me my last leaf. fun! Sudoku alert in scene with red, yellow, green sword clue. Pretty straight forward. Not any surprises.